What if your sprint plans actually matched the work your team was doing? Plan your next sprint like a pro with this template. Keep your sprint structured. Just having a list of to-do’s doesn’t help you understand if your sprint is on track. You can group tasks by columns by work stage then drag and drop tasks to a new column as they move forward. Add a clear owner and deadline to each task. Sprint planning is all about figuring out who on the team can tackle certain work in a specific timeframe. Give each task an assignee and deadline to make responsibilities clear. Make important details easy to find. Set your sprint up for success by tracking all the details for each task with custom fields, like priority and cost. That way you can ensure your team is focused on the top priorities without getting overloaded. Provide regular updates. 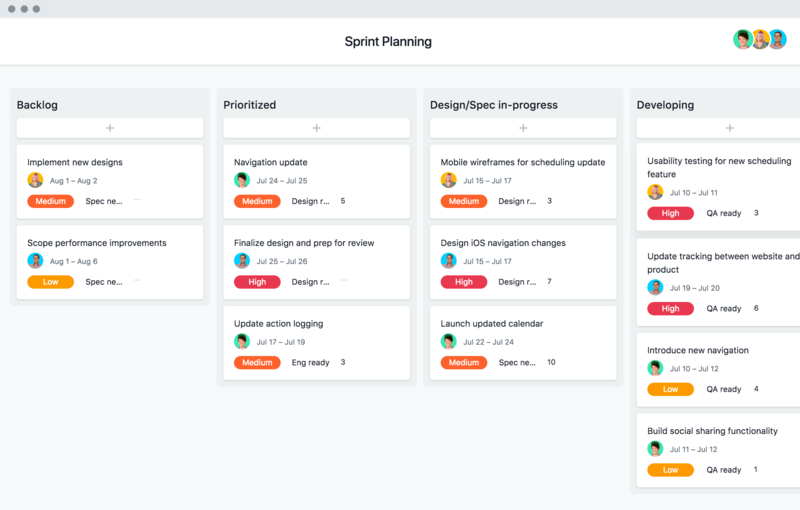 Your sprint plan in Asana helps kickoff, stand up, and retrospective meetings run smoothly because everybody can find their work and quickly give a recap without searching around or forgetting something. Follow an Agile workflow? See how to get your Agile work into Asana. How to plan and manage sprints in Asana. Sprints were designed for higher team productivity. Give your team a bigger boost with our tips. A template gets you started, but a free trial of Asana Premium is what keeps you going.